Fisheries and Oceans Canada was estimating there were 6 million late-summer run sockeye returning last August and September when it allowed 2.7 million fish to be harvested. Last week, when the final spawning numbers were released, it turns out only 4.27 million can be accounted for between the number that were caught and the number that spawned said Watershed Watch Salmon Society and Shuswap Environmental Action Society in a media release. “Fishery managers and the Fisheries Minister ignored obvious warning signs and allowed aggressive fishing based on flawed, risky assumptions,” said Aaron Hill of the Watershed Watch Salmon Society in the release. The release said the iconic Adams River population was hit particularly hard, with only 535,564 fish making it home to spawn; far short of the predicted return and the lowest on record for this dominant cycle. All but one of the other late summer Fraser sockeye runs also had extremely low returns. “By mid-October, we feared the return was going to be much worse than what was being claimed in the media, because we did not see the numbers of fish in the Adams River that should have been there for a return as large as the fishery managers had predicted,” said Jim Cooperman, President of the Shuswap Environmental Action Society. 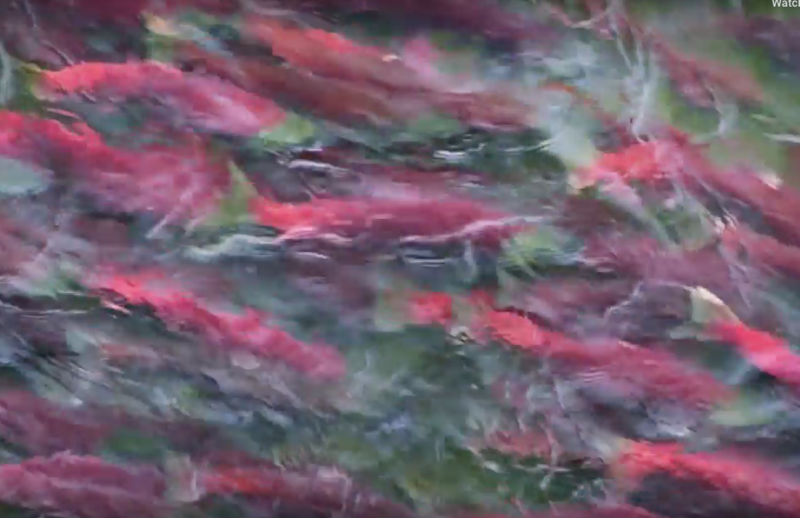 The release said in 2018 late-summer sockeye were the progeny of the 2014 run, which itself was overfished by a staggering 1.4 million fish. Several late-summer run Fraser sockeye populations were recently listed as “endangered”, “threatened” or of “special concern” by the Committee on the Status of Endangered Wildlife in Canada, an arms-length federal science body, and are being considered for protection and rebuilding under Canada’s Species at Risk Act. The numbers released on Friday by DFO and the Pacific Salmon Commission clearly tell the story of what happened to the late summer run. While the pre-season expectation was 7.4 million, the majority of the fishing decisions were based on a run estimate of 6 million, but the final total return (catch plus spawners) was only 4.29 million; an overestimation of 30%. The Pacific Salmon Commission is the joint Canada-US management agency that provides data and recommendations to the Fraser River Panel, which is responsible for designing and implementing the fisheries. Last summer, the panel, which is dominated by salmon fishermen, reduced the late-time sockeye ‘management adjustment’ to near zero (the number of sockeye added to spawning targets to account for fish that die between the river mouth and the spawning grounds). This both decreased any ‘buffer’ they had against such overestimations and increased the number of fish theoretically available to harvest. The panel exceeded their planned “allowable exploitation rate” of 58.4 percent on late-run sockeye, with a final rate of 62.9 percent. It was only due to luck that the harvest was not greater and the damage to the population more severe, as allowable catches of up to 3.5 million sockeye were possible if they had been able to identify additional fishing opportunities. “To reverse the downward spiral, we must change the pattern of exploitation that began when the first canneries were built on the coast at the beginning of the last century and learn from the way First Nations managed salmon populations for thousands of years,” concluded Taylor. Taylor suggests a combination of robust compliance monitoring with the reintroduction of known-stock fisheries, which harvest large proportions of the fish near their spawning grounds, where they can be accurately counted, thus ensuring enough fish return to spawn to sustain the stocks before fishing commences.